What's the/are the scientific papers/sources behind these statements please? I couldn;t find a ref source. Thanks in advance! "For example, it is important to get a minimum amount of zinc and copper in your diet, but it is also important for the ratio of Zinc to Copper to be in the 15 : 1 to 8 : 1 range"
Many of the ratios that are set are because the two nutrients compete for absorption. I will be writing a blog post on this very topic shortly if you don't mind hanging tight for a little bit. But in a nutshell, having higher copper, relative to zinc may be a contributor to pro-inflammation, disease progression, and aging. @Susan_RD_101 Thanks for the feedback! Ughhh, now I can't wait! I really look forward to your post about Zinc, and, especially, please help vegans about what to do. 1) Here are some sources of Zinc (next paragraph below) that might be good sources, but I have not seriously researched this to know any pros/cons. One thing I know is that copper intake is high w/vegans and zinc is much harder to get, so I really want to learn how best to optimize this potential serious problem. Possible good sources of Zinc might be: wheat germ, sesame, pumpkin and hemp seeds, lentils and garbanzo beans, watermelon, and quinoa. But, I do not know any pros/cons about choosing one over the other. Can you offer some better ideas or choices to consider, or why I may be mistaken with any of those I listed above. 2) Also, if you recommend a supplement too, then which formulation of Zinc is safest to take? Is there a vegan multi you can recommend that might cover Zinc, B12, and any other hard to get vitamins or minerals on a vegan diet? 3) One thing I am thinking about in order to get higher Zinc absorbed in higher ratios vs copper is to have high Zinc w/low copper diet days that focus on that nutrient. My only question is will that strategy work, because I don't know the metabolic processes and time-spans necessary to assimilate Zinc vs copper for optimal utilization. Any comments? Do we store and/or process Zinc differently than copper w/different metabolic time-spans? Thanks for your questions. Since this is such a detailed and involved question, I will try my best to answer in upcoming blog posts. Thank you, Susan! I can;t wait for the blog! I do take a zinc supplement. However, some days I have actually adequate zinc intake which made me wonder whether I should chose to take the zinc supplement in the evening after I know how my nutritional profile of the day looks like. I would also like to know 'how much zinc is too much' and which negative health effects could arise, if over a longer period of time the zinc levels are kept (too) high. Thanks for your questions! The blog post on Zinc:Copper will be coming out this month (after the post on Omega 6:3 ratios). Hi Susan, one thing I'm learning about mineral absorption, which would include Zinc too, is the Phytate problem can be reduced by several methods. One area wide-open for new/old foods is with mineral absorption enhancement by Culturing the Grains and Beans to make the minerals more bioavailable. This essentially can remove most of the anti-nutrient phytates to allow for much higher mineral absorption. 1) I'm aware of various Miso Soup Pastes that are based on cultured Soy and Barley. Are there other cultured grains or beans used for Miso or some other use too? 2) Tempeh can use cultured Soy beans, but are there other forms of Tempeh using other cultured beans or cultured grains? 3) Kinema is one I just found-out about, but I have no idea if it can be bought in stores we might shop at? Do you know more about this? There are three ways to decrease the inhibitory effect of phytic acid on mineral absorption from complementary foods based on cereal and legume mixtures. The first method is to remove the phytic acid, the second method is to degrade it enzymatically and the third method is to add compounds to the food that prevent phytate-mineral binding. Such compounds include ascorbic acid (7) and sodium EDTA (18), which improve iron absorption. Milling of cereals can decrease phytic acid by 90% as it is removed with the bran. Because phytic acid in legume seeds is contained in the protein bodies of the cotyledon and not the aleurone layer, the manufacture of protein isolates or concentrates tends to increase the phytic acid level. Phytic acid in legume protein isolates can similarly be decreased by ∼90% by dialysis or ultrafiltration after treatment with acid or alkali to overcome the phytate protein binding (19). Aqueous extraction with dilute acids gives a similar reduction (27). The most effective way to decrease phytic acid is by enzymatic degradation. Commercial phytases can completely degrade phytic acid in ∼2 h when added to an aqueous slurry of the complementary food held at optimum pH for phytase activity (28). Traditional food preparation processes such as soaking, germination and fermentation can also activate native phytases and substantially degrade phytic acid. Marero et al. (29) reported that germinating rice for 3 d and mung bean for 2 d reduced phytic acid by 44 and 41%, respectively. Subsequent drying, dehulling and milling of the germinated grains gave a complementary food containing 60 mg phytic acid/100 g instead of 780 mg/100 g in the corresponding whole-grain mixture. By including an additional fermentation step after soaking and germination, Sharma and Kapoor (30) reduced the phytic acid of pearl millet from 800 mg/100 g to zero. Germination unfortunately activates proteases and amylases as well as phytases and often results in an unacceptable texture of the porridge. More recently Barclay et al. (31) and Egli (25) used whole wheat, whole rye or whole buckwheat as sources of phytase to degrade phytic acid in complementary food mixtures based on cereals and legumes. By adding 10% whole wheat, whole rye or whole buckwheat to complementary foods (e.g., wheat and soy, millet and cowpea, and rice and chickpea foods) it was possible to degrade phytic acid completely in 1–2 h by holding the mixture in aqueous solution at the optimum pH of the phytase (25). I'll translate for anyone who didn't get that. Phytates or phytic acid are a component found in plants that can reduce the amount of minerals you are able to absorb from certain plant products. In general, they are found in grains, legumes, nuts, and seeds. Phytates are not destroyed by cooking, but can be lessened by sprouting, fermenting, roasting, and leavening. At an individual level, you can soak grains and legumes, roast nuts and seeds, and sprout lentils and mung beans. Other fermented products include natto, although it's a little hard to find, so tempeh is a good option. I'm also a fan of the bread Silver Hill's, which uses sprouted grains making for better absorption of zinc and iron. I've never heard of Kinema before! Please let us know what it tastes like and how you prepare it. 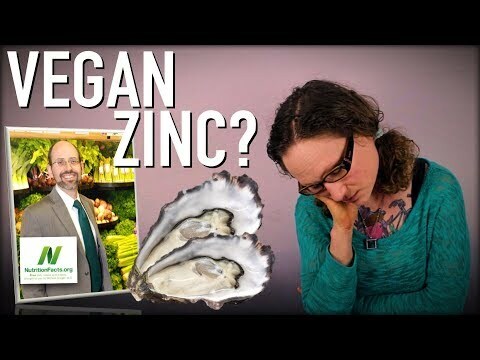 Love this zinc vid by bite size vegan! Love that you support the channel! We need more kids friendly vegan channels! This was a great video! I wonder if I should start adjusting my zinc recommendations for the men I see... LOL. But Dr. Gregor is also correct regarding the ratio. From the research I have encountered, the ratio of 8:1 seems like a pragmatic way to ensure minimum amounts of copper and zinc are met, but doesn't necessarily translate into deficiency/excess in the body. P.S. Blog post to be released next week! LOL Can't wait to read it! At the end of bite size vegan video, she shows her zinc intake for the day. But looking closely we can see most of her zinc intake comes from "broccoli, cooked, boiled, drained, salted", 11.7mg. I checked how mich broccoli this represents: 2.6kg of cooked broccoli!!! Are you kidding?!? That's more than 16.5 full cups of chopped broccoli or 14.4 medium stalks. There is no way someone regularly eat that amout of broccoli per day. Thus her result is boggus. I have been struggling to meet the daily requirement of zinc for men on my vegan diet and my zinc/copper ratio is out of whac of course. I am also a bit suspicious about the argument that this ratio doesn't matter with whole foods. The example you provided is something I sometimes see in the vegan community (which I am a part of ). I'm not sure if you read the blog, but my go-to sources of zinc on a plant-based diet are wheat germ, pumpkin seeds, and hemp hearts. Regarding the zinc/copper ratio, we can only make conclusions based on what research tells us. As discussed in the blog, our dietary/supplemental intake of zinc and copper doesn't necessarily translate into our blood or serum ratio of zinc to copper and as far as the research shows, there is no detriment to vegans who have a higher zinc to copper ratio. I am trying to make sure my diet optimises thyroid function and testosterone production as I suffer from chronic fatigue, headtache, tinnitus, low muscle mass, low bone mass and depression. Also I want to eliminate as much possible imbalances. I do eat hemp hearts wheat germ and pumpkin seeds (most effective) but it's not really enough. Sure I could eat loads of pumpkin seeds but then I would have some other imbalance such as too much fat intake. I read the copper/zinc ratio article in cronometer blog, I am not sure if it's the one you wrote. It recommends 16mg for vegans, I am barely eating 11mg which is the default cronometer setting. I did write the blog. The reason I recommend slightly higher intake of zinc for vegans is because phytates in food can interfere with absorption, as can high copper intakes. That said, there is currently no separate recommendation for zinc for vegans, so as long as you are somewhat above 11 mg, I am happy. Regarding amounts of high-zinc foods, if you were to include 1/4 cup wheat germ + 1/4 cup pumpkin seeds + 3 tbsp hemp hearts, you would get ~10 mg of zinc. I wouldn't be worried of the fat content, especially when it comes from whole foods. Alternatively, if you did want to supplement, I would opt for a low dose of ~10 mg per day. Let me know if you have any follow-up questions! Thank you for your reply Rachel. So if it's not a zinc deficiency causing my low levels of testosterone and free testosterone, my next suspect is mosaic Klinefelter syndrome. I'm not familiar with this condition, so can't comment on it. However, I do encourage you to keep working with your doctor to get to the body of this. Testosterone can decrease with age or other medical conditions, but thankfully there are medical approaches to treating this.